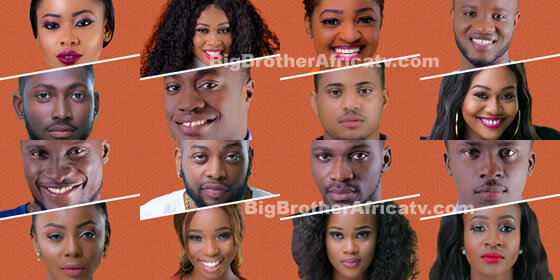 Big Brother Africa 2019 | Season 10 Housemates, News, Contestants, Live Stream, Polls, Nominations: Week 3: Eight pairs of housemates are up for possible, who are you saving? Week 3: Eight pairs of housemates are up for possible, who are you saving? Angel and Ifu Ennada, Bambam and Teddy A, Cee-C and Tobi, Lolu and Anto, Miracle and Nina, Princess and Bitto, Rico Swavey and Ahneeka, Vandora and Dee-One are up for possible Eviction this week. Tonight saw the second Nomination show on Big Brother Naija 2018 and it was definitely one to remember. As we all watched with bated breath, each pair representative walked into the Diary Room and spoke their truth. As the Housemates gathered in the living room, looking tense and rather glum after they had put in their Nominations, Biggie's voice boomed through the House and they awaited their unknown fate. That is when, in true Big Brother style, he threw another spanner in the works and told the Housemates that none of their Nominations mattered anyway. Due to their bad manners and disregard for Big Brother's House rules, they would all be up for Nomination. All but Queen Khloe and her partner K.Brule, as HoH, Khloe was allowed to save one pair, she chose LeoLex and we all know why. There was an array of emotions exhibited during the Nominations, from Nina and Alex looking as though they were about to cry to Vandora practically smiling. Everyone used a different mask for their stress. However, even though the Housemates' Nominations laneded up being null and void that didnt mean the outcome was any less interesting. Turns out Mina, Loto and Cebi were the most Nominated pairs. In a weird move BamTeddy did not end up voting for Cebi, even though it was obvious that the two Alpha males in the pairs see each other as a threat. The fact that LexLeo Voted for Mina also came as a surprise because Alex and Nina have become close recently - That could be the explaination for Alex's river of emotion. Now that eight of the pairs are up for Nomination there is sure to be a change in the Housemates’ behaviour. Survival mode has been activated and this always tends out to bring out the most extreme aspects of human characteristics. Eight housemates' pairs are up for possible Eviction this week, who are you saving?